When you visit the National Air and Space Museum, you'll touch another world...literally. 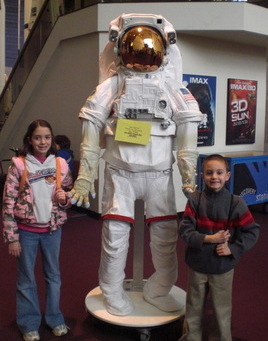 Where else can you get your picture with an astronaut (suit)? Where else can you actually touch rocks from the moon and from Mars? Where else can you see a real space shuttle, a Stealth spy plane, the Concord supersonic airliner, and hundreds of other aircraft from the last hundred years? What if I told you it was free (except for parking)? It's almost too good to be true. But it's not. What many people don't realize, is that it actually has two locations: the one on the National Mall in Washington DC, and a newer location, the Steven F. Udvar-Hazy Center near Washington Dulles International Airport. First, here's what you need to know about the Mall location. The National Air and Space Museum in Washington DC is located right on the National Mall, just a few blocks from the Capitol building, and a short walk from the National Gallery of Art and the National Museum of Natural History. It's a literal treasure trove of science and space. Here, you can touch a rock from the moon (it's black and smooth!). There, you can touch a rock from Mars (sorry-- not red...also black and smooth). You'll also see the Apollo 11 command module that orbited the moon, the Spirit of St. Louis that Charles Lindburgh flew on his first non-stop transatlantic aircraft crossing, and a 1903 Wright Brothers flyer. And that just scratches the surface! A must for kids: The "How Things Fly" exhibit, featuring over 50 interactive exhibits with buttons, pulleys, flying balls, and other things to please everyone from little ones to adults. Don't miss the free Planetarium show (everyday at 11:30 am - make sure you get free tickets upstairs at least 30 minutes before the show). An astronomer will guide you through a 25 minute planetarium show of what's in the night sky. You'll walk out better able to identify the current stars and constellations, plus get a free evening sky map. It's an aircraft lover's dream! You can get a free flight simulation experience by going to the Sea-Air Operations exhibit on the second floor. Tucked into a little corner is a flight simulator that lets you practice landing a jet on an aircraft carrier. Much tougher than you'd think! The National Air and Space Museum at the National Mall is open daily, 10 am to 5:30 pm, except for Christmas Day. 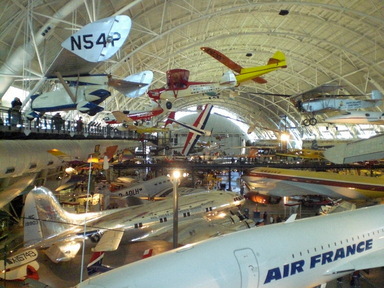 Admission to the National Air and Space Museum is free. There is no museum parking. Public lots are nearby; fees vary and aren't cheap. 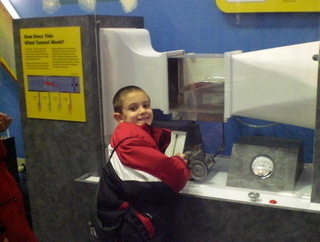 Checking out the wind tunnel at the "How Things Fly" exhibit. A Food Court featuring McDonald’s, Boston Market and Donatos Pizzeria is located on the ground floor at the eastern end of the building. Note that they close at 5 pm. Food, other than bottled water, is not allowed in the museum, so you can't save money by buying your lunch. Personally, we prefer eating at the cafe at the National Gallery of Art, located just across the National Mall. Just a few of the aircraft you'll see! This is where you find the really big "toys." The museum consists of a couple of IMMENSE aircraft hangars chockfull of airplanes, spacecraft, rockets, and satellites. There's also a tower where you can watch airplanes take off and land at nearby Dulles International Airport. Compared to the National Mall location of the National Air and Space Museum, the Udvar-Hazy Center is less hands-on and more visual. Our kids especially enjoyed the interactive computer screens that let you select from a variety of aircraft and get a 360 degree view from inside the cockpit. We were all fascinated by the cases showing astronaut gear, including astronaut food--Russian cabbage soup in what looks like an immense toothpaste tube and freeze-dried scrambled eggs (ugh!). Less appealing but strangely fascinating are the selection of astronaut diapers and--shall we say, "personal evacuation devices." You get the picture. Doesn't make me want to sign up to be an astronaut. Like the National Mall location, they offer several IMAX movies at similar prices. Next to the IMAX entrance is the stairway down to the elevator you'll take to go up the tower. About 8 stories up, you'll get a bird's eye view of nearby Dulles International Airport. Aside from having a great view of the Blue Ridge Mountains, you'll be able to see planes take off and land at the airport. The Steven F. Udvar-Hazy Center is also open daily, 10 am to 5:30 pm, except for Christmas Day. One of the moon capsules they fished out of the ocean. Admission is free. Museum parking is $15 per vehicle. You can purchase an annual parking pass for $65. When you're hungry, there is a McDonald's and McCafe on site, featuring the usual McDonald's fare, as well as muffins, cakes, and coffees. As at the National mall location, no food other than bottled water is allowed in the building (yep, they check your bag), so bagged lunches are out. But there are numerous strip malls and restaurants located within a 10 minute drive of the museum, along Route 50. Want to see a layout of the museum? Click here!